Former GC President Shirley H. Showalter speaks about her memoir, Blush, during an Afternoon Sabbatical on Oct. 8. 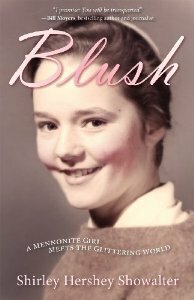 Former Goshen College president Shirley Hershey Showalter released a new memoir today, “Blush: A Mennonite Girl Meets a Glittering World” (Herald Press, $15.99 paperback, September 2013). The memoir traces Showalter’s childhood in Lancaster County, Pa., as a sheltered little girl with big dreams in a family and church caught up in the midst of the cultural changes of the 1950s and ’60s. Showalter, who joined the Goshen College faculty in 1976, served as the 14th president of Goshen College from 1997 to 2004. On Oct. 5, during a Homecoming Weekend open house on campus, Showalter will read from her memoir. 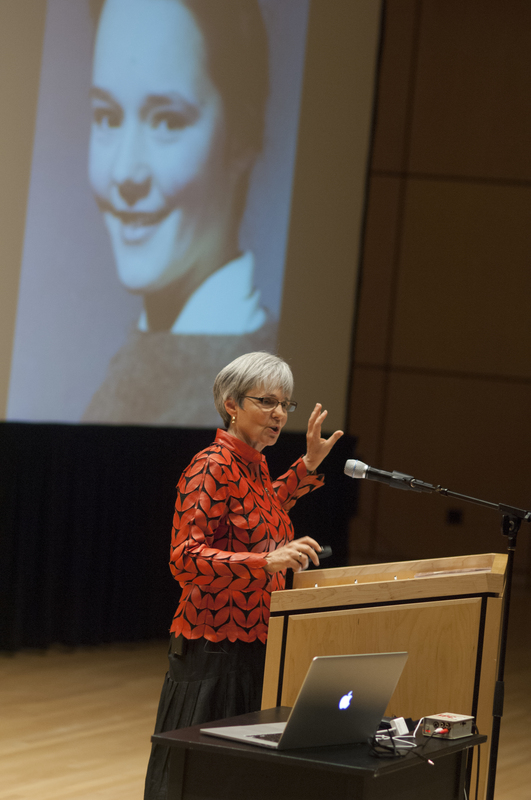 She will return to campus on Oct. 8 for an Afternoon Sabbatical program, during which she will speak about the three-act structure of her memoir as it imitates life, and how her experience at Goshen College shaped the memoir. 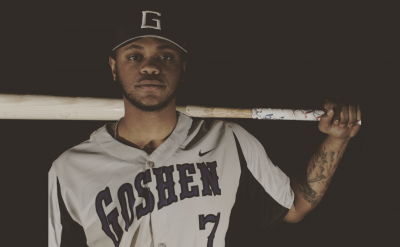 “I can point to several ways the book is related to my 28 years of service at Goshen,” Showalter said. 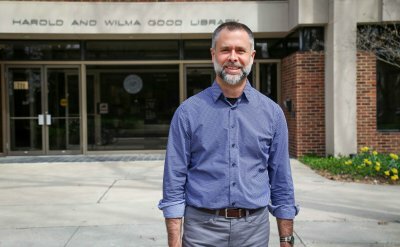 “I first taught the personal essay in the expository writing course in the English department. I loved this assignment and observed how students wrote better when they wrote personally. When I became president in 1997 I taught a course called the Literature of Spiritual Reflection and Social Practice. In many ways, the decision to write a memoir grew out of the approach to reading and writing the students and I developed in that class. Showalter describes her memoir as equal parts “Mennonite in a Little Black Dress,” “Growing Up Amish” and “Little House on the Prairie.” It’s “a richly textured and affectionate look at an American religious subculture that has fascinated outsiders for centuries, complete with Mennonite recipes and vintage photos,” her website reads. Born into a plain-dressing, plain-speaking Mennonite farm family in Lancaster County, Pa., Showalter was named for Shirley Temple, a movie star she was forbidden to watch. She grew up with her nose pressed to the window of the glittering world, “protected from its supposed evils by parents and preachers and kind ladies with hankies in their pockets,” she writes. Evoking the simple joys of a farm childhood, Showalter recounts life on the hundred-acre “Home Place” that formed the center of her world. “I didn’t distinguish between play and work for a long time,” she says. Much of her childhood as a “free range girl” was idyllic, but Showalter also tells of the hard work of farming, lean times and friction in her extended family. Showalter graduated from Eastern Mennonite University in 1970 and entered graduate school at the University of Texas at Austin in 1972, from which she received a doctorate in American Civilization in 1980. She joined the Goshen College faculty in 1976, becoming a professor of English in 1989. On Jan. 1, 1997, Showalter began her presidency at Goshen College and served in that role until 2004. During those years she was awarded the John S. and James L. Knight Presidential Leadership Award and other honors. The school’s endowment grew from $46 million to $90 million, several new buildings were erected, including the $24 million Music Center, now one of the finest of its size in the Midwest. She also oversaw the formation of the college’s core values and a strategic plan for the next decade. After her presidency at Goshen College, Showalter became a foundation executive at The Fetzer Institute, a nonprofit, private operating foundation that fosters awareness of the power of love and forgiveness in the emerging global community. She is now a writer, speaker, blogger and consultant living in Harrisonburg, Va.
“I hope that readers will feel peaceful when they put down the book, and I hope they will reflect on their own lives with deeper appreciation for the blessings in them,” she said. Former president Shirley Hershey Showalter will read from her new memoir, “Blush,” and sign copies. Enjoy a sampling of Mennonite home recipes from the book. 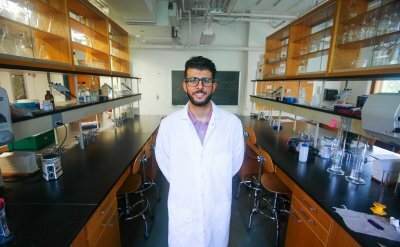 Program begins at 2 p.m. Free and open to the public. Using her own recently published memoir “Blush,” about growing up Mennonite in Lancaster County, Pa. in the 1950s and 60s, former president of Goshen College Shirley Hershey Showalter will talk about the three-act structure of memoir as it imitates life. Using photos, artifacts and hymns, Showalter will illustrate some of the discoveries she has made in the process of writing her memoir, including her improbably path to Goshen, Ind., and to the presidency, which became more visible as she explored the joys, fears and longings of her childhood.